Biological motion holds a privileged role in visual perception, undoubtedly due to its pervasive nature in our everyday environment. When viewing non-biological motion, details such as colour, form, and shape may be necessary to identify the object providing the motion. However, when viewing biological motion, such details can be reduced to simple point light features that mimic the same visual characteristics. People are capable of perceiving walkers using these dots. They can go as far as recognizing walkers with limited limbs that are viewable, and can even identify walker identity. These examples point to a behavioural advantage to the processing of biological motion. Developmentally, newborn infants are found to be predisposed to favour upright orientations of point light walkers, relative to inverted point light walkers From a neuroscientific perspective, much of the literature presents unique activation of the superior temporal sulcus (STS) to biological motion. Altogether, this evidence shows a unique mechanism of processing visual biological motion in humans. 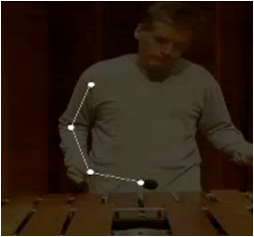 We are currently exploring the role of biological motion in audio-visual integration, growing out of the surprising patterns of integration observed previously in our marimba illusion.